Have you ever asked yourself if you’re a minimalist by nature? Since the publication of Marie Kondo’s now infamous book The Life-Changing Magic of Tidying Up in 2014, along with a growing awareness of the negative impact of excessive consumption and fast-fashion, there’s no doubt that the minimalist trend has gone mainstream. More recently, though, you might have noticed the inevitable backlash of “maximalism” making an appearance in interior design and fashion blogs all over the Internet. I have a sneaking suspicion that most of us find ourselves caught between these two extremes, at once both longing for more white space and serenity in our lives, yet also perhaps drawn to beautiful, intricate patterns and longing to collect our belongings around us like magpies. I’ve struggled with minimalism for as long as I can remember. Growing up in the nineties, long before I’d ever learnt to KonMari a space, I went through dramatic phases of collecting anything and everything (stamps, sea shells, wild flowers, buttons — you name it) and then going through massive purges. A month or so later I’d inevitably regret the latest purge for one reason or another, but I couldn’t seem to break the cycle. As someone who struggles to reconcile the two competing urges to collect and purge, stepping into the home of artist and art historian Barbara Crawford in the Shenandoah Valley is a huge relief. Full of natural light and beautiful, interesting objects from her work and travels with her husband, she proves that you don’t have to be a minimalist to create a thoughtful, uncluttered home. Here are six principles I learned from Barbara’s home that we can all apply to our own living spaces, especially if minimalism doesn’t come naturally to us. 1. Make the most of natural light. Think about where the sun will shine into your home throughout the day and arrange your furniture accordingly; for example, you might want to put your desk in a sunny spot for midday and your dinner table where the sun comes in during the evening. Place mirrors opposite windows as well as opposite other mirrors to amplify the sense of light and space. 2. Work from a white base. Whether it’s white (or pale) walls, a white marble countertop or white dinner plates, making sure you have plenty of white in your home can provide you with a base that you can then add color to. This will help to create a calm and uncluttered atmosphere. 3. Contain and frame the chaos. Whatever you collect or love, if you have stuff everywhere in your home, then it will start to make your space feel overcrowded and cluttered. Keep items grouped together in a gallery wall, display bureaus, shadow boxes or shelves, with plenty of white space around them for some breathing room. 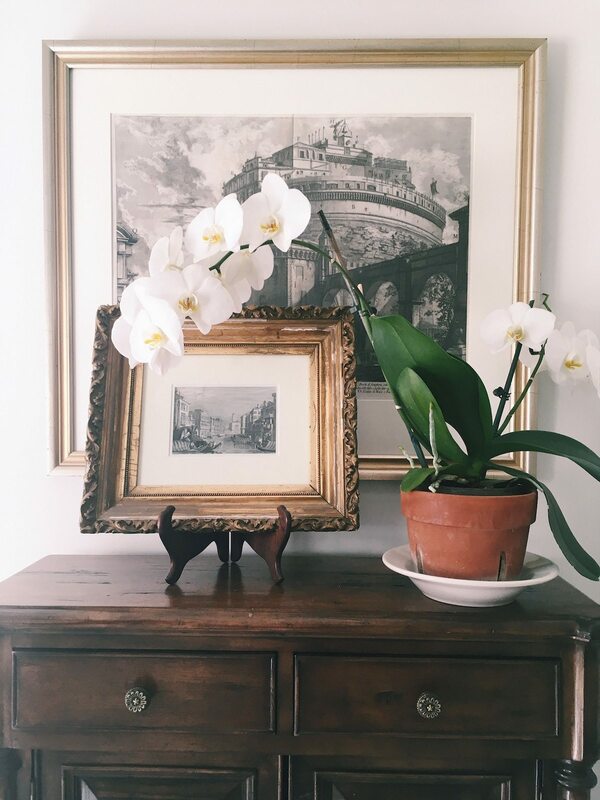 You can create beautiful eclectic displays of interesting objects and as long as you’ve done it in an intentional way, your treasures will be on display without the room feeling overwhelmed with stuff. You don’t have to be a minimalist to embrace William Morris’ advice to “Have nothing in your houses that you do not know to be useful or believe to be beautiful.” Don’t hold onto things just for the sake of it; if you love it or know you do (or will at some specific time in the future) use it, keep it. Everything else can go. 5. Give as abundantly as you keep. It’s true, being too attached to our possessions isn’t good for us. After all, things break, accidents happen and all of our stuff could disappear in a fire or natural disaster. Use the fancy china for a dinner for your friends once in a while, lend books and make regular gifts of various possessions when the moment feels right. Living generously will ensure your belongings don’t start owning you. The real joy for a collector is in the stories behind the stuff: the antique market in Paris where you stumbled across a beautiful statue, the set of colored glass bowls you found at a flea market that reminded you of the bright blue Californian sea on a family holiday. Make sure you keep telling yourself and others the stories behind your treasures to help the memories last, creating a truly loved and meaningful home. For those of us who are collectors (and maybe even maximalists) by nature, we don’t have to try to force ourselves to be minimalists. If you get joy from beautiful details and objects, then let your home embrace and reflect that. Here’s to a life well-lived and abundantly enjoyed, with overflowing bookshelves and souvenirs from adventures in far-flung lands to show for it. Are you a minimalist, a maximalist or somewhere in between? Sophie is a freelance writer and journalist currently living in Norwich, England with her husband and daughter. She loves adventures in beautiful places, believes in the power of empathy, is passionate about encouraging ethical and sustainable lifestyle choices, often wishes she lived in a Jane Austen novel, and loves nothing more than a good book and a cup of hot chocolate. You can join her free online creative writing club, The Writing Habit, via her website. Thank you! Great article, very helpful, with practical tips, and even better, grace to be oneself. This article came at the perfect time! I just moved into a new studio and I want it to be a beautiful place that helps my creative juices flow, but am also afraid of falling into old patterns of cramming lots of junk into a space. These tips are the perfect guideposts (and I’m already feeling on track having painted everything white)! I think we try to define minimalism too extremely, but the core of it is a great ideology to try and embrace at the level that works best for you. I also was huge into collecting things, and not so good at getting rid of them, so for 24 years I’ve just had things accumulating. I’ve been working at purging myself of things that have not been used in YEARS, and while I still have a long way to go, I find that everyday I do a little bit helps. I want to get to the point to where I can move into a small space , and living with few things I have to take care of so I can focus on my business and myself. So much of life (at least mine) is spent taking care of things I don’t really need or want, and I hate this feeling of drowning in stuff. While I probably won’t ever get to the point others do (especially running my own handmade goods business), exploring minimalism has started me on my journey to peace of mind! I think I’m somewhere in between! I always see stuff that I want but have to remind myself that I probably don’t need it – I think that’s a money issue too though. This sounds like such a millennial thing to say, but I would rather spend money on experiences than stuff which I will probably throw out in a year. Great post! Thanks, Cait! Yes, these days I find myself wanting to spend money on travel and experiences more than stuff, too. I like your take on minimalism. To me, minimalist is just being content and happy with what you have. There’s no real need for labels, especially ones that stress us out! Very true, Charmaine! It’s funny that we sometimes feel pressure to conform to an aesthetic that doesn’t come naturally, isn’t it? !